After months of preparation, hectic schedule, trials, research, findings and running the day finally has come, the day when you will tie knot with your significant other, with your love of life. The day has arrived when you will say wows to each other, when you will finally be his forever, when you will have a new title for your life and so on and so forth. For many this day would have come after dating for so many years in a row, after fighting with family to get hitched, after so many tense situations at home at it happen literally when you break news of your relationship to your family members. So many things happens before an actual wedding takes place, and everything has its own charm that a couple memorize after their wedding for generations. Sometimes a wedding is a simple sweet love story, and at times people struggle for getting wed-locked with the person they have loved for years. Life has its own way of unfolding itself and wedding is one among those ways, you can’t predict things, yet wedding is a special moment, and great event of any couple’s life. 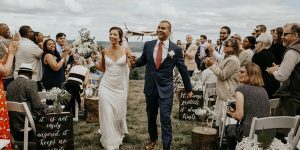 For all those who are preparing for their big day, this article is specifically meant as it includes the insight, how to make a wedding day a happy, memorable and amazing event. The day is special for every couple. 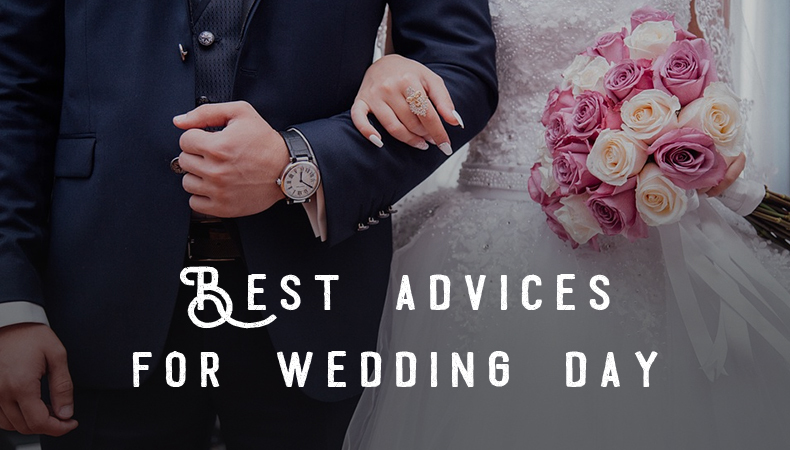 Here is an exclusive list of best 41 advises for your wedding day to make it worth experiencing. First thing first, sleep on time the night before your wedding. We understand that it is nearly impossible to get sleep the night before your wedding, as you are excited for your big day and in different zone all together. Yet, it is important for a couple to get sound sleep for the wedding day is going to full of rituals, ceremonies etc. It is essential so that next day you can be your best at your wedding celebration. You can listen to some melodious piece of music to help you slip into a sound zizz. Avoid late night sleep night before your wedding. 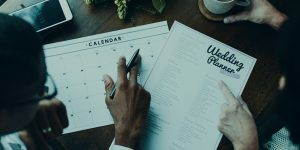 Never plan your bachelorette party(s) just a day before your wedding, in fact try to plan it at least a week ahead of time. On the day of wedding, there are so many ceremonies and rituals take place that you hardly get time to feed yourself the way you do otherwise in normal days. Chances are that you can go long hours without eating, so it is advisable that you eat high proteins and carbs as first meal on the day of your wedding as this food takes longer time to break down in your body, which is important to keep you going. DO NOT SKIP BREAKFAST, no matter how busy your morning is. You are a bride/groom today. Now the planning time has gone it is the D-day and you have to just relax, it is important. You don’t need to contemplate anymore about what and how will it happen, you have already given enough to it. Ask your bridesmaid to confirm timings with your vendors like your photographer, make-up artist etc. Now handover the cash (if you have to make payments) to either a family member or to your friend who you trust fully. Stay yourself away from planning and coordinating now. That is completely fine if you are planning your wedding all by yourself, but there is always a limitation to everything and here on the day of wedding it will be difficult for you to manage things, as you will be busy in wedding rituals. So, it is better if you hire a professional for handling the day-of logistics and if you can’t afford the same and want to cut on this expense you can appoint someone from the family or your bridesmaid to look after the preparations and logistics of the wedding day this way you would be able to keep the drama at bay, it will be a great support and will let you have a stress free day. Be a guest at your wedding and not the staff. Do not just plan everything on the day of wedding itself, it will become chaotic. You cannot line up your manicure, pedicure, wax etc. in the morning on the wedding day as you run out of time doing this. Have a clear schedule for the day, that doesn’t make you run from one place to another. Your wedding should be filled with fun and enjoyment rather running for getting things done. Your parents are very important and this is the day when you will leave them and settle with your husband in his house, you may be getting married locally but the moments which you will spend with your parents on your wedding day will not come again. These are the moments which you will experience only once and that’s special. They are also in the seesaw of the emotions. Daughter’s wedding is a matter of great happiness for any parents but at the same time this is the most emotional event of their lives. Let them feel special with your presence! Wedding day is a day full of so many things, so many rituals, so many ceremonies, so many people around etc. All in all a wedding can be a stressing day for one. On top of it if you are person who gets anxious for even small things then it is better that you surround yourself with only calm people on your wedding day. It will not only help you maintain your calm but also you will have a stress free day. Choose your vendors like your photographer, make-up artist, hairstylist, caterer etc., wisely with whom you feel comfortable upon meeting them initially. You will need a chauffeur driven car for yourself specifically, make sure that you arrange the car and the driver beforehand. As you will need car for going to the parlor to get ready and this car should be dedicated for you. As may be while getting ready in the parlor you may realize that you missed to bring your dupatta, in such situation your bridesmaid can go and bring the same for you. The point is there can be many occasions where you will need a cab and time fly so fast in your wedding day so it’s better to be prepared well. You may be looking for everything perfect at your wedding and some small mistake happened from your vendor’s end, try to not react badly it is not good. It will not only spoil your mood but also their confidence to work with you. Which is not good at all. Yes, wedding decor and other things are luring especially when you have been planning for everything and you wanted to make things perfect on your wedding you must be intrigued to check all the details beforehand. Don’t do that. Wait for the right time to witness all that, while you will walk down to the stage you will be able to have a glimpse of everything from lighting to floral, candlelight to linens etc. Wait for the right time, there is no charm in watching half-done preparation. Instead you focus on what is to be done by you. Unlike your daily routine arrange your wedding outfit and the other accessories at one place. Having an organized attitude on your wedding day can save your time and save you from any chaos which is must. Have outfit, your shoes, accessories, and lingerie etc. at one place. Also, let your photographer take some shots of details like your wedding dress and shoes. Arrange things in a manner that it becomes easy for the photographer to capture them effortlessly without you being embarrassed. Also, very important don’t forget to remove stickers from the shoes. It is very important, if you will have routine of your wedding day handy you can follow it easily and comfortably. Whereas waiting for the last minute will make things chaotic which is not good. If you are getting ready at the venue itself then chances are that all the visitors would want to see you while you are getting ready which will ultimately hamper the smooth functioning. You can politely and respectfully ask your visitors to respectful of your time while you are getting ready. Also, you can hang a polite note outside the door asking people not to disturb. Often brides get their make-up and hairstyle before and wear their bridal outfit later which is not advisable as it can spoil your hair or make-up while wearing clothes or pulling off the ones which you are already wearing. To maintain the beauty of your make-up and hair make sure you wear your outfit first like your lehnga and its blouse and later after getting ready you can get your duppatta done. You may feel hungry in between it is better that you ask your bridesmaid to keep some dry snacks like chocolate or chips in her bag so that whenever you feel like eating something you can munch on them. Don’t stay hungry on your wedding day, you may get headache due to these hunger pangs. These candid shots while you getting ready are very crucial and you should not miss them. Ask your bridesmaid to click few selfies and some candid shots of yours to have them as keepsake of the day while you are getting ready. Natural is always good, you must have heard this “excess of everything is bad” and it holds true here also. Don’t overdo your make-up, also, over use of perfume should be prohibited. Strong smells can make you feel nauseous and even attract bugs. When getting ready make sure that you handover all your essentials like your phone, gold chain, gold ear rings, ring etc., to your bridesmaid. If you will try to have them with you, chances are you may lose them while taking care of other things. Make sure your bridesmaid is trustworthy. If your parlor has provided you with and assistant well and good but if not then it is good that your bridesmaid keep a small pouch of make-up handy. So, whenever a touch-up is needed she can do the needful as you may need touch-ups in between and if the wedding is summers then is most imperative. Chatty guest is inevitable part of any wedding. You may also encounter someone like such guest maybe your aunt, its better you appoint someone to talk to them and listen to their chats. You don’t have to their ears it’s your wedding not any run-of-the-mill event. How you are in person is different as this is your wedding and you need to greet people with a smile so that they feel comfortable in your wedding. There may be people you must have argues in life, or you may not have a nice rapport with them but respect their presence, respect that they made time for your big day. Remember, they would be equally disturbed with those emotions of past while making for your big day. Greet them with a smile, whosoever he/she is. Standing with blunt face will not add to your pictures, and no one like a bride showing angry emotions either. After the garlanding and your couple shoot, there will be a time for feras especially where you will need to change your dress and believe you me it is really very, very tough to undo all the tucked pins and clips. Better you take someone’s help in changing your dress, otherwise it would be very difficult task all in all. It is very tough for a bride to go to washroom in that 15 kg lehnga, Bridal lehnga is very heavy outfit and to pee in that is a task in itself. It is advised that you have your bridesmaid around to help you pee whenever you wish to go. It’s for your comfort and ease. Your wedding is the day which is full of events, people, and ceremonies and so on. You need to dedicate some time for the couple photography so as to have some beautiful amazing portraitures for your album and your wall too. Make time for your couple photography and ask your bridesmaid to coordinate with the photographer accordingly for the same. It is your duty to locate some private spot for your couple’s photography beforehand because on the day of wedding you will not get enough time to do all these things. 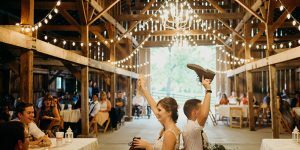 Have a mental note of that and communicate the same to your wedding photographer beforehand as he would also want some such place to capture your portraits without any disturbance. Yours maybe an arranged marriage and chances are you have spent less time together, but on your wedding it is essential to have some cozy and candid pictures of you and your partner to have them decorate your bedroom walls and good for your album too. Listen to your photographer’s instructions, if he asked to get a bit close, get close then he is your husband no more a stranger now. For that it is advised to spot some private location wherein elder people are not peeping to see what’s happening. 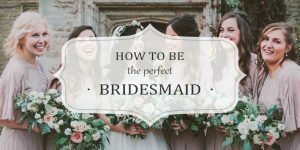 While you are on the stage, you may encounter n number of small things which are not right, in such a situation do not directly raise the issue instead ask your bridesmaid or the coordinator to handle the issue. You speaking as bride will sound blunt, not good anyways. Every couple is made to eat together surrounded by few close people. Yes, you may find it difficult, you may feel nervous while eating with so many people looking at you. Still make sure that you eat a bit otherwise it will look rude and arrogant at your part. It is your duty to ask your bridesmaid well in advance to stay near you and eat when you will eat. Like this she will be helping you at dinning, like if something is needed to be arranged she can be your voice. You need not to call out for the attendant to bring ice-cream for your husband and his friends that can be taken care by people present there. It is natural that some of your groom’s friend crack some jokes, you may or you may not like them but giving immediate reaction will not do any good. Many people might not even notice the severity of the joke but if you will react on that there and then, surely that will not go unnoticed at all and will spoil your image. So, keep in mind that in an event like weddings such things happen, people say something quirky sometimes, learn to avoid them if you don’t wish to laugh on the. Jokes are jokes, learn not to take them seriously even if you have temperament issues. Even if you wanted everything perfect in your wedding, and something didn’t happen your way like the floral you wanted couldn’t be arranged don’t worry it’s perfectly fine as you two are important not these petty details. Focus in what is important not on what is not so important. Remember, you can’t control anything anyways. Don’t forget to have some group photos, we understand you must be tired of smiling, greeting etc., but it is mandate to have some group photos of your wedding so that tomorrow when you flip through your wedding album you can cherish their presence and feel glad about the same. Group photo with people who attended your day also make your guests feel special. Let them feel special upon making your day special by attending. It is your wedding once in a lifetime event, at least today you can keep your phone away. Hand it over to your bridesmaid and groom’s to their groomsmen. Focus on your wedding, you can attend congratulations call other day also. At your wedding if your spouse to-be propose you to dance, make sure you dance. As this is your day and it is very special for you two, celebrate it with love, laughter, people, dance and music. For, tomorrow when you will think of your wedding you will have all the good memories to cherish and you will love them all. When you approach your stage, just be relaxed and calm. It’s okay, you don’t need to be nervous at all. Remember, that you are surrounded by the people you know. Amidst all the joy and celebrations, you should never forget to live those emotional moments like your smile should come naturally it should not be faked. Only then your wedding photographer will be able to capture you candidly. Don’t have stiff face, be natural and real. Your smile is the best ornament which you should wear mandatorily. Last but not the least, have fun. It is your wedding and you should have all the fun amidst all the celebrations, events and rituals. Don’ forget to have fun on your wedding day it is most crucial, it is something you will miss all your life. Even your photographer would be able to capture your happy faces of the moment to seize great memories for you of you two. This is your wedding make sure you plan everything a way before and not on the day of your wedding. Expect the unexpected on your wedding. You surely don’t want to feel rushed out the door if timings run over! It is advised that you endeavor to get ready an hour before your ceremony begins. This way you can have some relaxation and also your photographer would be able to capture few candid pictures of yours. To have a peaceful and stress free wedding day start practicing mindfulness few months before your wedding. Even practicing some yoga and meditation will also help you have calm mind at your wedding. Remember what’s important, just stay calm, cool and relaxed. Don’t be anxious and distressed for any reason large or small.